Your shadow, perfectly captured in mere moments! 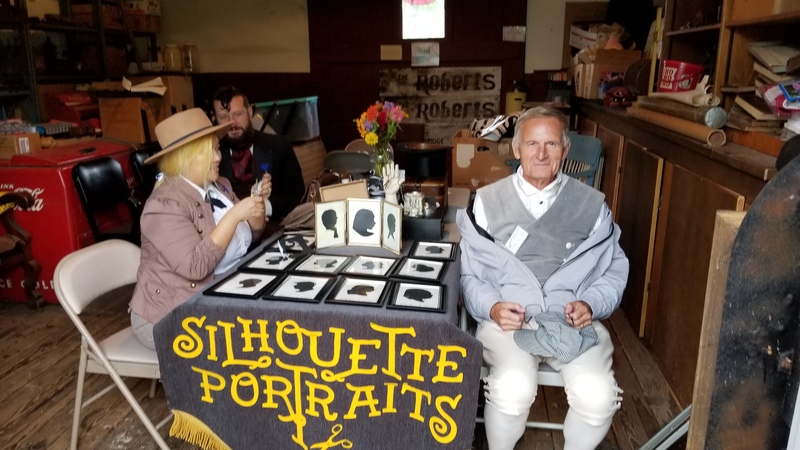 I am a professional fine artist practicing the very rare art of SILHOUETTE PORTRAITURE, in which I cut your shadow from paper with no writing instruments - simply freehand drawing with scissors. 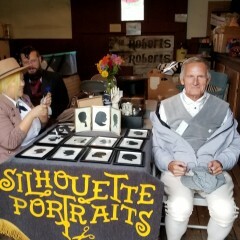 My act has all the instant gratification of the photobooth, but with a dash more class: it takes me about 90 seconds to cut a guest’s perfect likeness from a piece of paper. 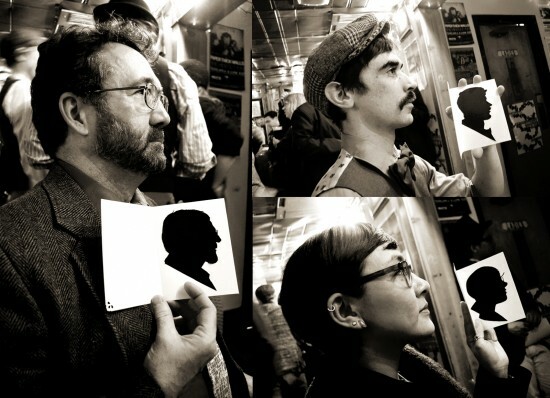 Silhouette portraiture is one part history and one part how-does-she-do-it?! sideshow that culminates in an heirloom party favour. As there are fewer than sixty of us working in the world, it's a very memorable and unique addition to any event. I accept gigs all over the world, though a travel stipend applies. Nina made my event so much fun. 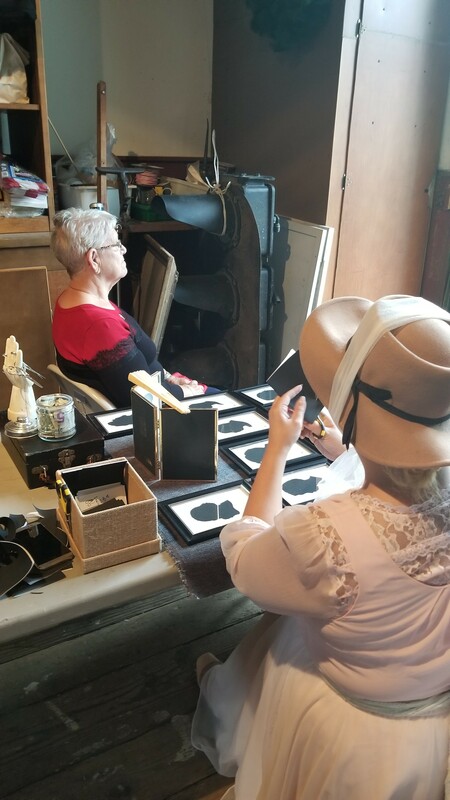 Our guests were absolutely amazed at her talent and efficiency. Definitely would recommend. Nina was Such a Treat to Have! People went crazy over Nina's talent - which you can't deny. 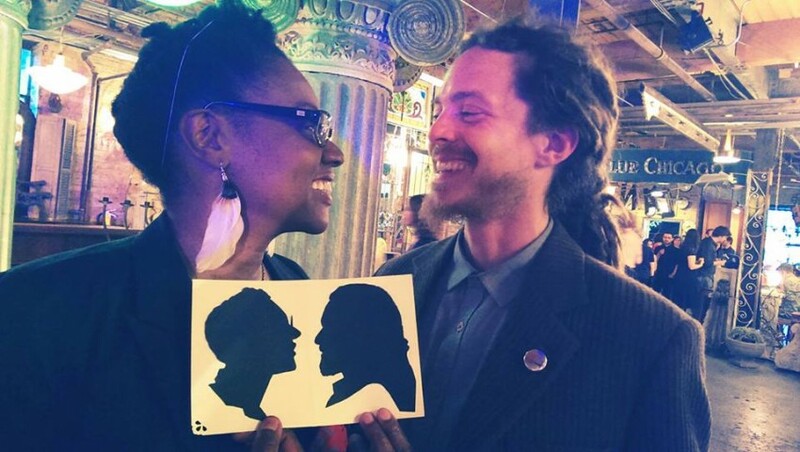 Nina came timely, professionally and did an absolutely beautiful job with the Silhouette art. Such a nice treat to have guests take home after the night was done. I would be glad to have Nina again. She, plus her help, were such kind people. A pleasure to have. All my guests were surprised by the idea. Nina was friendly and very efficient. I would recommend her. I know some of my guests thought it was really fun. We just finished having a Great Gatsby party ...and of course..we HAD to have Nina!! She is sooo professional and everyone..simply EVERYONE loved her!! If you are planning on an event and want something that everyone will love..this is the gal to hire..Soooo talented, kind, and fun!! She should be booked Every night!!! love her and hope to have her again!! Nina made our party, everyone was in awe of her talents! Nina is a true artist and very professional! 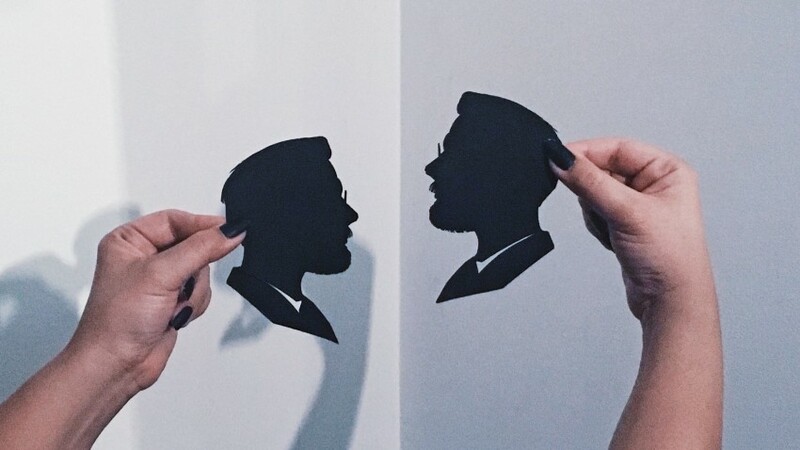 Nina's silhouette portraits are beautifully hand cut and look true to life! She was so pleasant and professional! 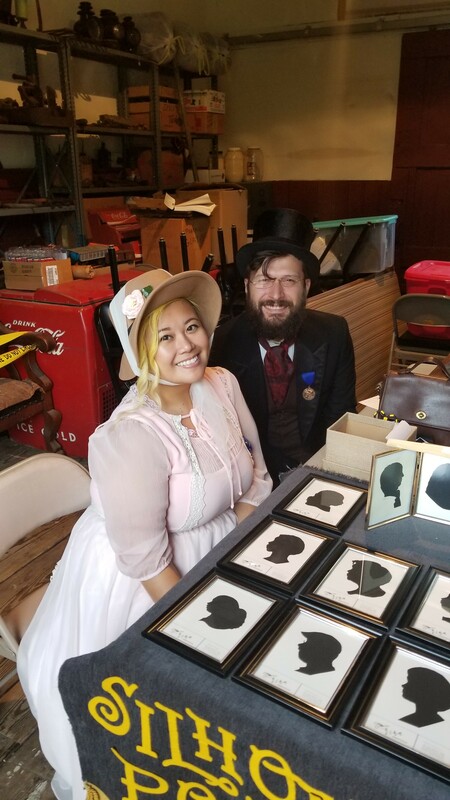 They dressed in character for our Village's Bicentennial celebration. 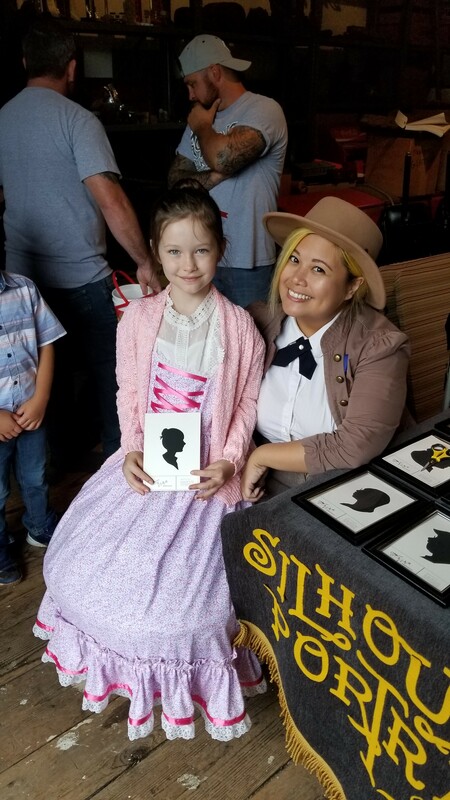 She was as big hit with all ages and a highlight of our event! 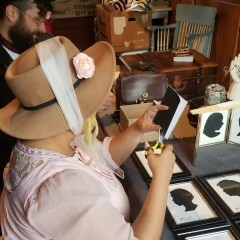 Her silhouettes were a perfect memento for everyone. I highly recommend Nina and will definitely ask her to come back again if we have another event! 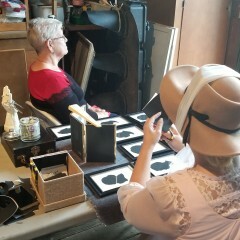 She was beyond amazing, very quick and it was so exciting for my guest to watch her in action. 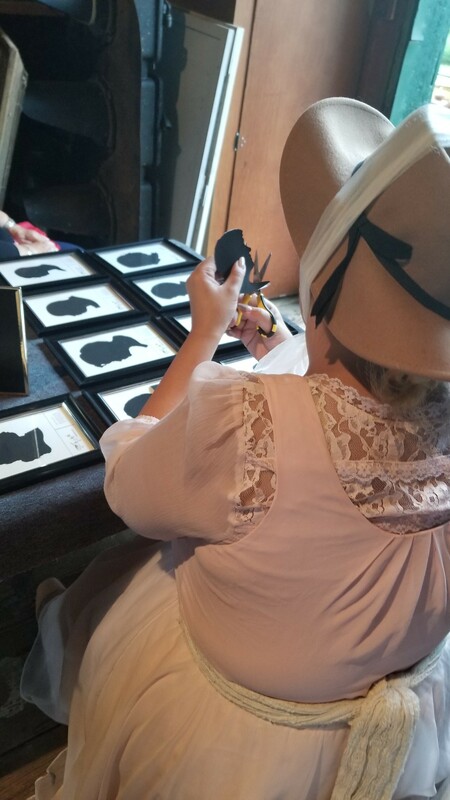 All my guest loved their silhouette, everyone at my party was able to get one. She had made my sons party one to remember. Thank you so much!!!!!!!!!!!! I was searching for entertainment that wasn’t typical for my wedding. Nina was engaging, flexible, and professional. 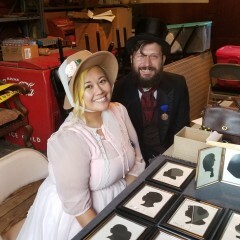 Guests were provided with a unique memento from our day. I cannot say enough nice things about Nina. 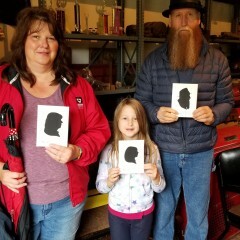 From the moment we started corresponding about hiring her to cut silhouettes, she was so easy to work with and took the time to get to know me. This really enhanced our event, since by the time we actually met face to face it felt like meeting an old friend. She even brought me a gift from my hometown! Her set up is really beautiful and generated a lot of excitement amongst our guests. 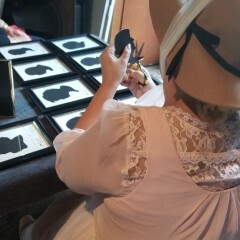 She customized the backing for the silhouette to match the theme for our event, making for a really special keepsake. Nina is just a lovely person, inside and out and I give her my highest recommendation. Nina is the best--a true artist! 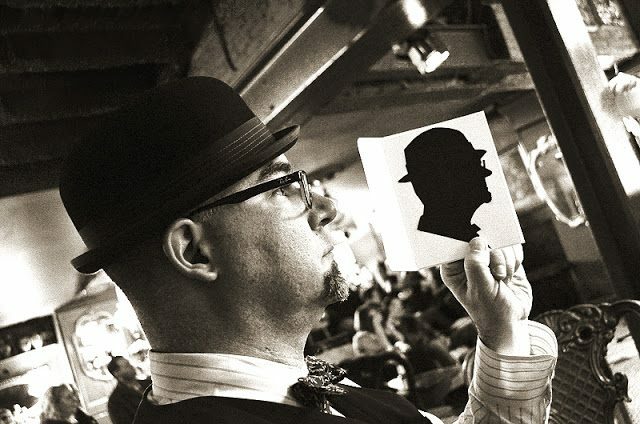 As director of the DePaul Humanities Center, I hired Nina to provide silhouette portraits for attendees to our public event investigating the nature of shadows from the perspectives of the arts, humanities, and sciences. The event was attended by 80 university students and faculty as well as the Chicago general public. Nina was perfect in every way. She was punctual, professional, courteous, and kind. And on top of this, she is just an amazing artist. Although she works with incredible speed, it was soon apparent to everyone how fantastic her work is, and so the line to have portraits snipped grew and grew! It was the best decision I made to hire Nina. 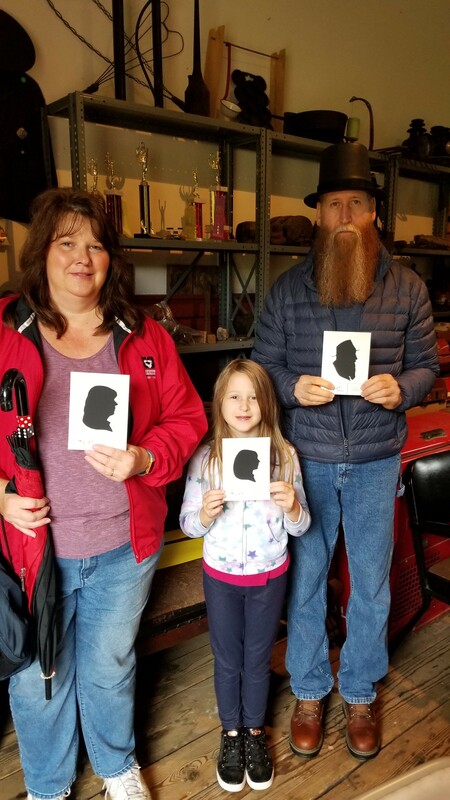 These are not the silhouette portraits you might remember from kindergarten in which every black construction piece of paper is cut pretty much the same and each of your classmates is identical in profile to the next. No, Nina is so talented--a real artist--that she captures the actual profile, character, and spirit of her subjects. 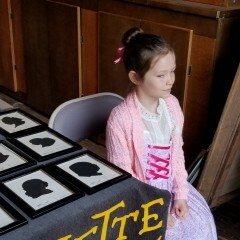 (Two twins sat for her and we could match up the resulting silhouette portraits with complete accuracy!) Nina is the real deal. We look forward to having her return for another event soon. As promised by other reviews she was nothing short of a hit! There was a line the ENTIRE night and people were so excited about them! She did a great job and was wonderful to work with! We would definitely have her and her assistant back! Nina's painted fragrance bottles for our event which served as a great alternative to engraving. She was extremely friendly, talented and professional and was a pleasure to work with. 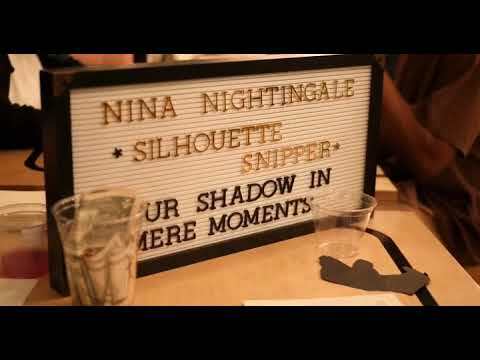 Nina did silhouettes for our Chicago bar wedding reception. 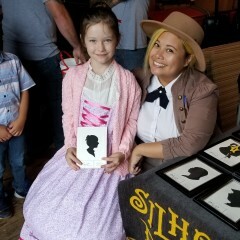 She was so sweet and her work is fantastic. She had no problem accommodating our last minute request to extend her another 30 minutes. I highly recommend Nina as the perfect addition to any unique event! Nina Nightengale rocked Winter's Night! I found Nina online and after our first communication I knew she was a professional. We worked together to determine the best options for the school fundraiser and although I didn't meet her until the night of the event, I knew it would be smooth sailing. She was amazing and very organized and willing to be flexible. The product was unique and memorable. Thank you, Nina for being part of our night. I will definitely remember and think of you in the future. 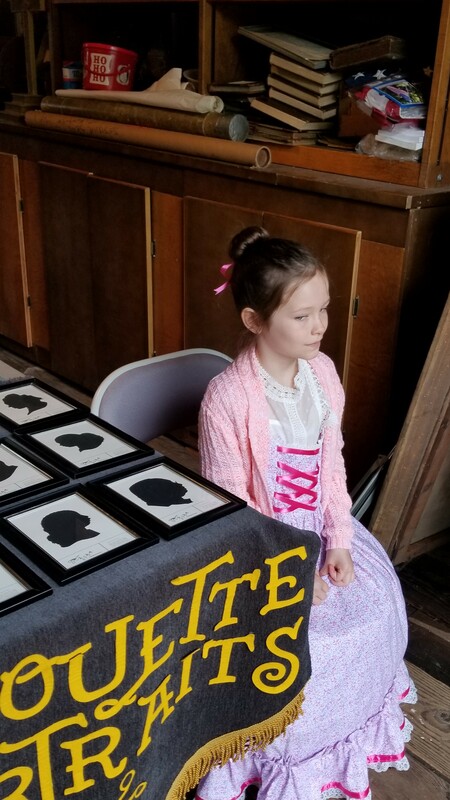 Nina was great and was a big hit at my daughter's college graduation party. Weeks later and guests still tell me how they thought she was a great addition to the party. She is very pleasant to work with and a true artist. She did a particularly good cut of my son and nephew arm wrestling that I know they will enjoy for a long time. I recommend her highly. Nina is amazing! I hosted a graduation party for my son with approx. 75 attendees, and Nina was the HIT of the party. She is extremely talented, very personable and reliable. I booked her for three hours and she was busy the entire time. 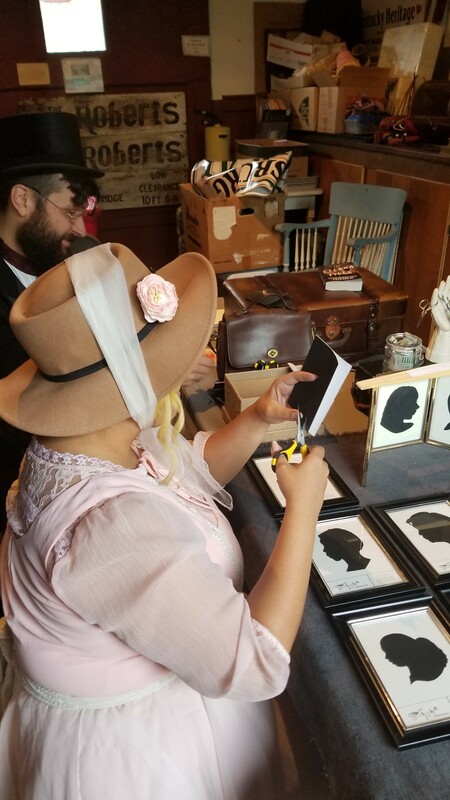 Everyone loved her and especially loved their unique silhouette keepsakes. She's quick, too, which was wonderful as she was able to cut approx. 12-15 silhouettes per hour. Who knew someone could develop such a talent with scissors. I *highly* recommend Nina!! Review by Red H. A.
Nina was super professional, very self-motivated, and did an amazing job with her silhouette cut-outs. Everyone was raving about how cute they were!